Healthy Inside ~ Fresh Outside..!! 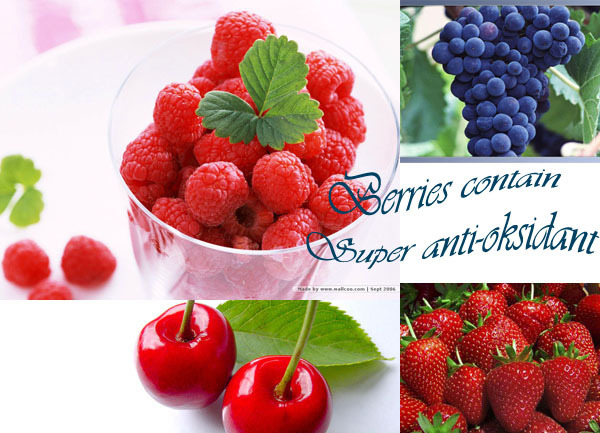 : FOUR FRUITS FOR BEAUTY SKIN WITH THE HIGHEST ANTIOXIDANT. FOUR FRUITS FOR BEAUTY SKIN WITH THE HIGHEST ANTIOXIDANT. Our beauty tips today will talk about the crucial antioxidant in fresh fruit for our beauty skin. Why? Because antioxidant can decrease the free radical caused of aging. By consuming much antioxidant it decrease the wrinkle in face. Trying to plump out the skin and make it youthful. Either your skin or body will fresh and smooth. Moreover, antioxidant helps repair of sun damage. We know, too much sun is dangerous. It will be drying the skin and damaging the cells. Therefore, we need to consume the fresh fruits contain a lot of antioxidant to evasive all skin damage. Thus, you should wonder what kind of fresh fruit which is contain a lot of antioxidant. Then, do you know Berries contain super healthy antioxidants? For example; Blueberries, strawberry, raspberry and cherry are the first rank of the highest healthy antioxidants. For further evidence, just one cup of wild blueberries has 13,427 total antioxidants — vitamins A & C, plus flavonoids (a type of antioxidant) like querticin and anthocyanidin. How about more cups? What rich vitamins will we get!